Coupon Specifics: Mention coupon when calling to receive discount of $20 off a complete window cleaning job of $95 or more. One discount per customer. No cash value. May not be combined with other offers. A Pane in the Glass Window Cleaning Company is your best bet for getting your windows sparkling clean both inside and out. 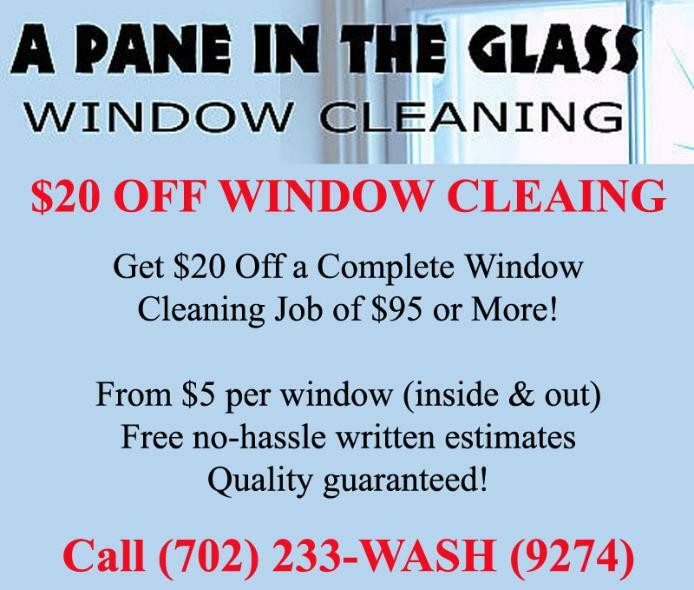 If you don’t want to do it yourself call the number one window cleaning company in the Las Vegas area, serving Las Vegas, North Las Vegas, Summerlin, Henderson and Boulder City. Call today to obtain a free, no-hassle estimate! * We start by removing, marking, and cleaning all screens. * We generally begin cleaning the outside of your windows first, using a soft strip washer and a very concentrated window cleaning solution. The solution we use will not only make your windows sparkle, but it’ll protect the glass from the harsh elements. * We then thoroughly wet the window with our strip washer and solution, squeegee the water off, and towel dry around the edges where water collects. * After the outside windows are done, we’ll then move our operation inside and repeat the process. * When we’re inside, we clean the window tracks* and window sills*. * It’s now time to put all of the clean screens back in place. * To finish up, we will walk around your home to double check the windows and put all of your furniture back where it was. We pride ourselves on quality. And all of our work is satisfaction guaranteed. Any streaks, smears, smudges, or finger pointers will be dealt with immediately and with vigor. We are also fully insured and bonded for your total peace of mind. If you want a window cleaning you’ll be happy with-one where you’ll tell your friends and neighbors-then please contact us!